Let's face it: blackheads can be difficult to cover up. The mixture of oil and sebum that hits the skin's surface creates large black dots that darken your skin, enlarge your pores and look unsightly. Instead of dropping cash at the drugstore, you can quickly banish blackheads and shrink pores with home remedies that work to naturally cleanse, tone and balance the skin. Much gentler than prescription medication, natural blackhead remedies will have you saying bye to blackheads and hello to beautiful skin. It's crucial to stick to a cleansing routine twice a day when trying to eliminate acne-causing bacteria from your face. Help combat blackheads with a homemade wash consisting of 1/2 cup of rolled oats, 1/4 cup of water, 1/2 tablespoon of honey and 1/4 cup of lemon juice mixed in a bowl. Scoop a dollop onto your fingertips and gently massage onto your face, in small circles, for at least 30 seconds. Rinse with warm water and pat dry with a clean towel. The oats exfoliate the skin and absorb excess oil; lemon kills bacteria, while the honey adds necessary moisture back into the skin. Two or three times a week, use a natural abrasive scrub that exfoliates dead skin cells, brightens your complexion and evens out the skin's surface. Mix together 3 tablespoons of fresh cream, 1 cup of white sugar, 1/2 cup of brown sugar, 1/2 cup of ground almonds and 2 tablespoons of olive oil. Massage over your entire face in a circular motion for 1 minute. First rinse with warm water, followed by a splash of cold water all over your face. Pat dry with a clean, soft towel. Cover any extra scrub with plastic wrap and place in the refrigerator for the next use. 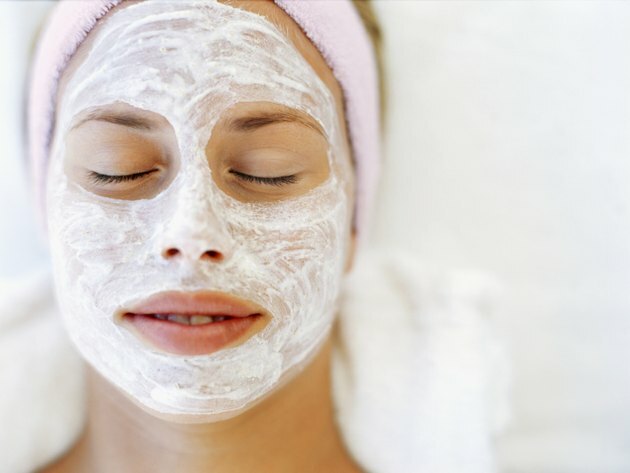 Apply a homemade mask to your face twice a week. Mix together 1 part almond powder and 2 parts rose water for a smooth paste. The almond helps exfoliate the skin, while the rose water acts as a mild antiseptic. Smooth the mask on your face using your fingertips, being careful to place a generous amount on the problem areas. Leave on your face for 15 minutes and then rinse thoroughly with cool water. Place any remaining mask in the refrigerator for the next use. According to Dr. Alicia Zalka, a Yale-affiliated dermatologist, oily and acne-prone skin benefits from a toner. Not only does it help remove traces of leftover cleanser or mask, but it helps to slough away dead skin cells. Make a natural remedy for your blackheads by boiling 2 to 3 teaspoons of basil leaves in a cup of water for about 15 minutes and allow it to cool. Dip a cotton ball into the ointment and swipe along your entire face. The basil acts as an antiseptic to blackhead-causing bacteria and helps to improve circulation. You can also pour the ointment into a spray bottle and spritz your face throughout the day for a quick refresher.